Dearest most beautiful friends and family we would again like to humbly welcome you all back to year four to join us for another epic holiday adventure. An adventure of love, sharing, sustainability, music, art, colour, technical wizardry, healing, imagination, laughter and joy. A family adventure where we will write our own story as we immerse ourselves in the stories of the past, the present and the future. A truly inclusive adventure for everyone, young and old. 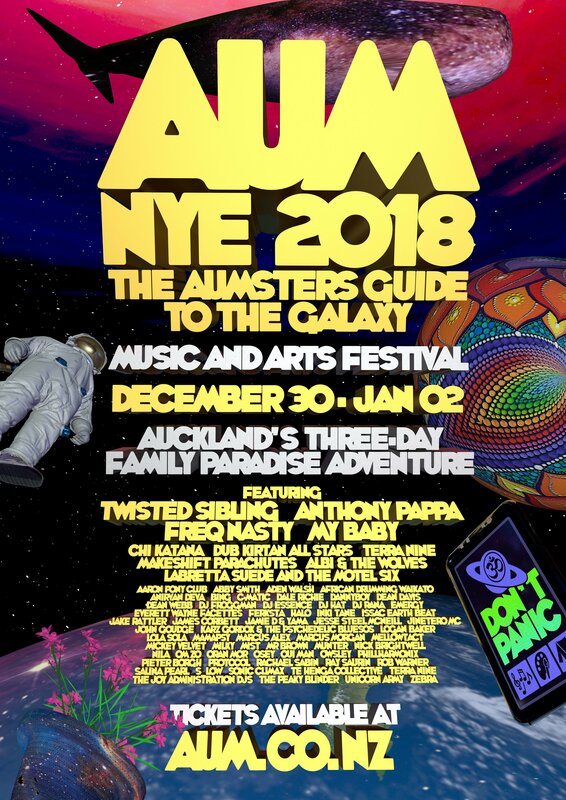 Please bring your friends, your family and your children and join together as one to celebrate this New Year’s Eve at this specially designed AUM camping, music and arts festival... held on the most beautiful, spacious, lush, well appointed festival campgrounds in the country, just 1 hr from the city. 3 days and nights doing as you please on the most beautiful festival camp grounds in the country - 400 hectares of free roaming dear farm // The friendliest most inclusive festival vibe and culture // 4 incredible music stages with the finest sound quality // Fully themed fancy dress Family event (242 children on site last year with very happy parents) // Healing // Yoga // Rongoā Maori // Chill spaces // Workshops // Installation art // Glow and fire // Circus acts and gala show // Live art // Markets // Delicious food // Wandering Adventures // Children's club // Movies // Astronomy // Sustainable culture // Incredible lighting and projection art // Stunning event decor and stage design // more than 70 bands, djs, solo musicians, live electronic artists and drummers from all around the world and Aotearoa and so much more. Please join us for fun as we attempt to breaks and set new world records for: The most unicorns at a single gathering. The most people wearing an item of tie dye clothing at a single gathering. And most importantly; The least amount of waste per person at an international festival.